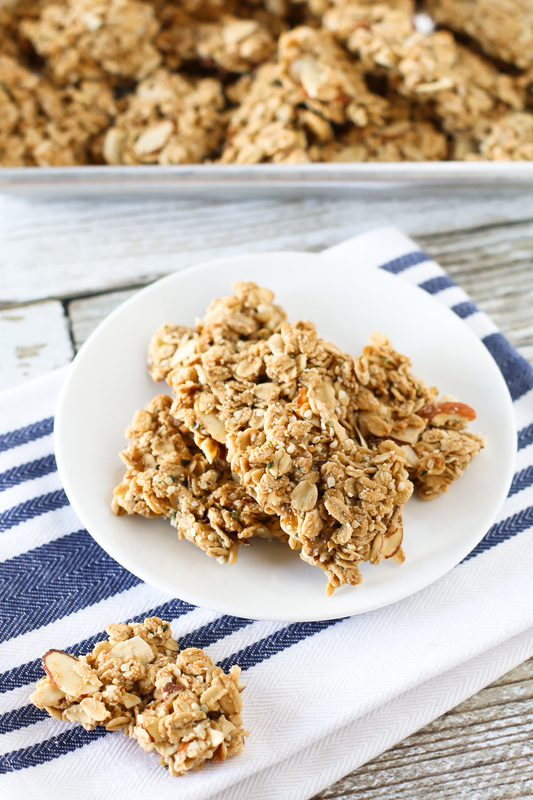 Gluten free vegan maple almond granola clusters. The best part of granola! 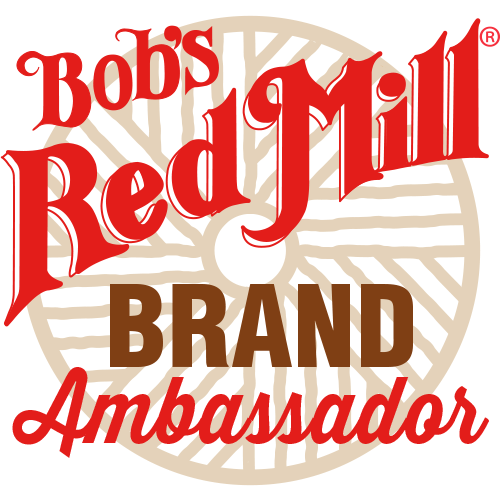 Crunchy clusters of maple-sweetened granola, packed with almonds and completely irresistible. I have a serious problem. I am completely addicted to homemade granola. I leave it in a huge mason jar on the counter, just waiting to be eaten. A little here, a little there. Before you know, it’s gone and I have to make another batch. Oh darn! The best part of homemade granola are those big, crunchy clusters that you can pick up and easily eat. I always get so excited when I get those big chunks. It’s like finding the hidden treasure. 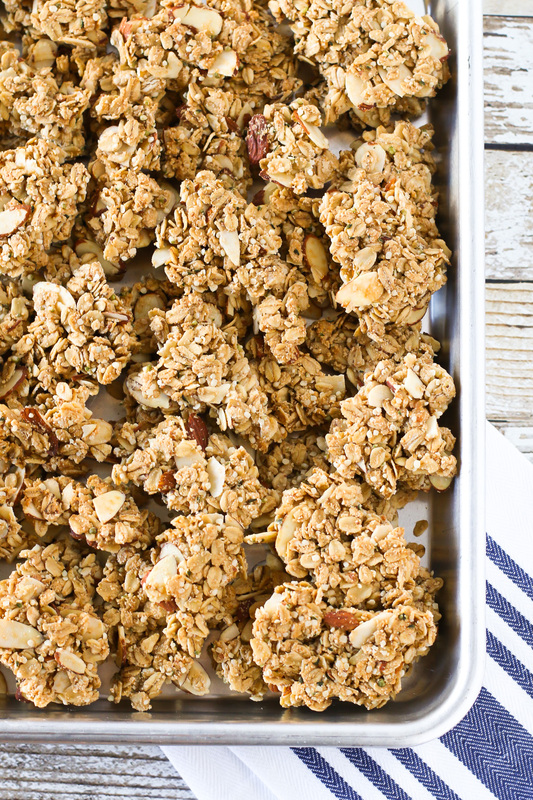 Why not make a WHOLE batch of granola clusters? Making granola clusters isn’t really any different than making regular granola. You just have to avoid stirring the granola while baking and when it comes out of the oven. Resist the temptation to stir! As it cools, the granola hardens and keeps it’s shape. I also pressed the mixture together before baking. Would you look at that? Beautiful, crispy granola, loaded with sliced almonds. There is almond flour in there too, which helps in the binding. I added some hemp hearts for even more protein. I kind of add them to just about everything. Maybe the other reason I like making homemade granola so much is that it comes together so quickly. One bowl recipes are the best. Am I right? 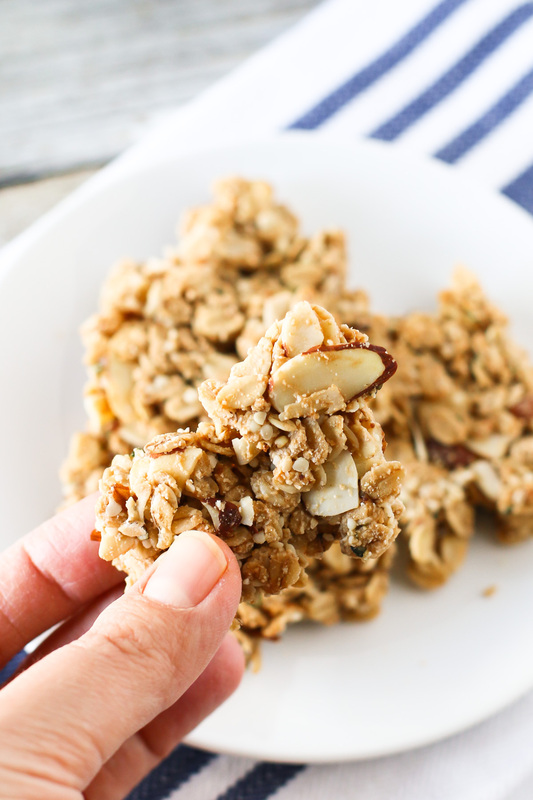 Not only are these maple almond granola clusters super simple to make, they are refined sugar free. The perfect on-the-go snack or just a little something to hold you over before your next meal. No matter what time of day, they are just crazy good! In large mixing bowl, whisk together maple syrup, melted coconut oil, coconut sugar, vanilla and salt. Mix until smooth and the oil is incorporated with the sugar. Add oats, almond flour and hemp hearts. Stir with rubber spatula or large spoon, until well coated. Gently mix in sliced almonds. Spread granola onto prepared baking sheet. Flatten slightly with rubber spatula. Bake granola 15 minutes, rotate pan and bake additional 15 minutes. Rotate pan a third time and bake 8-10 minutes. Granola should be golden brown. Remove granola from oven and do not stir. Place pan on cooling rack to cool completely, about 1 hour. 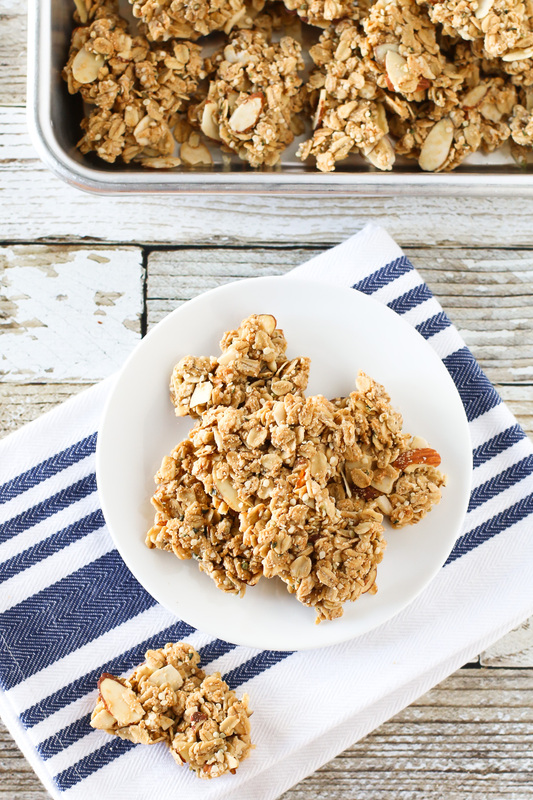 When granola has cooled, break into clusters. Store in airtight container.